Loyal Blog Followers know how much I liked Bart Bonte's Factory Balls. Boo! is Bart's latest and it's a stencil puzzle, just like Factory Balls. There are only 16 levels. They get pretty hard. But, I've done them all. 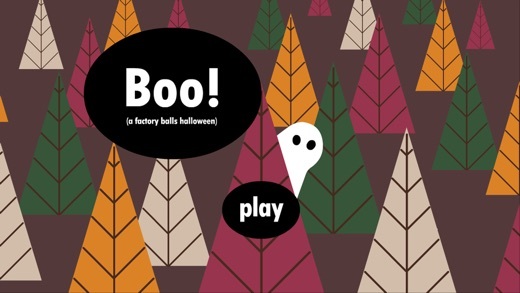 Get in the spirit of the holiday and play this. Cubesc comes from Cagri Gecin. It's been on my mind for a few weeks. That first image! It's haunting. Look at the Teddy Bear! The object is to get Your Man/Men to traverse over all the squares and end up on the final square. We've seen this genre numerous times. 3. Some squares need to be crossed twice. 4. 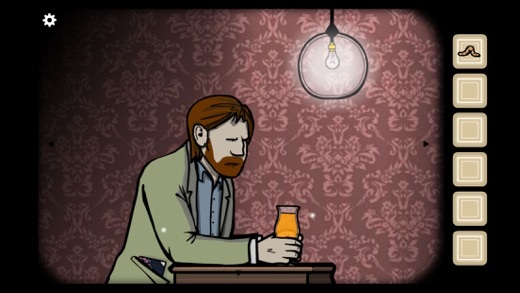 2 characters have to solve their respective fields at the same time. This is when things get most interesting. There are approximately 70 levels and I've done about 25. CraCol comes from Nguyen Truong. 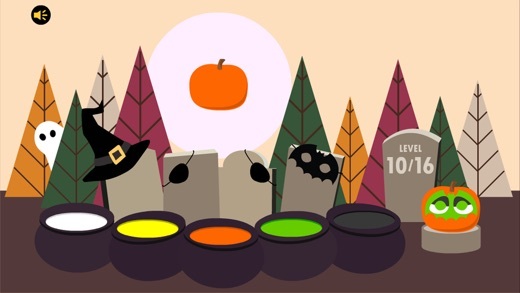 The object is to score points by creating rows, columns & diagonals of the same color. There have been some other games very similar. This starts very easy with just a few colors. As more are added, things get harder. I like the graphics. I also like that some of the pieces are doubled. Once was enough though. My score was 281. Number Array comes from an zhuona. His description: The goal of number array is to arrange the numbers into four rows ordered from top to bottom, 1 through maximum, each row having a different color. 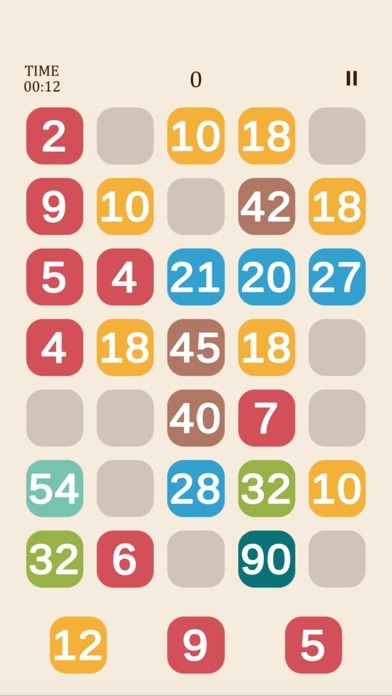 At the beginning of game, you have 4 blank spaces to place the numbers. A blank space can be filled by the next value of the same color as the number to its top. 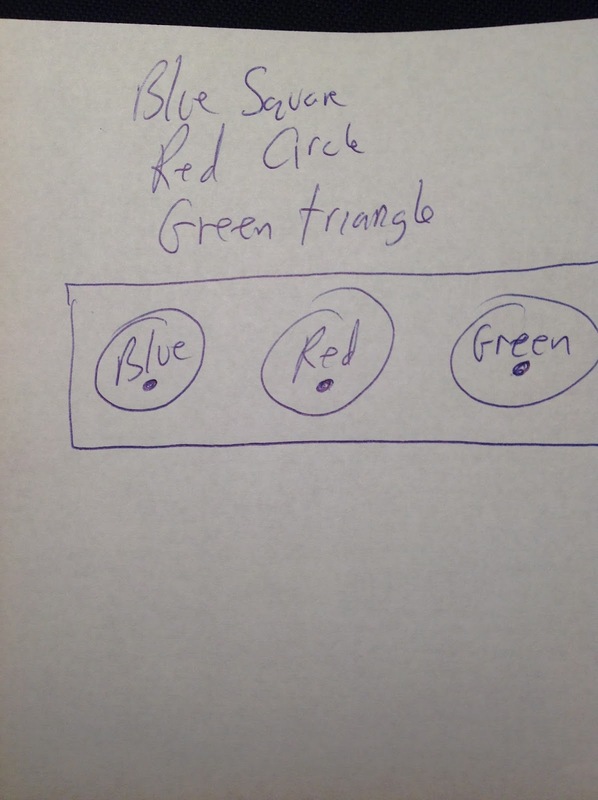 For example, the 4 of red can be placed in a blank space to the right of the 3 of red. No numbers can be placed to the right of a maximum. If there are multiple blanks to the right of a maximum, none can be used without moving the maximum. My thoughts: this is an interesting game that involves interesting strategy. Multiple times I ran into trouble and had to restart. My only complaint is that the shades of blue are a touch too similar. 1. 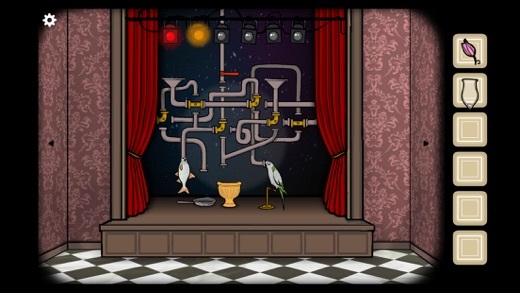 How are these puzzles generated? 2. 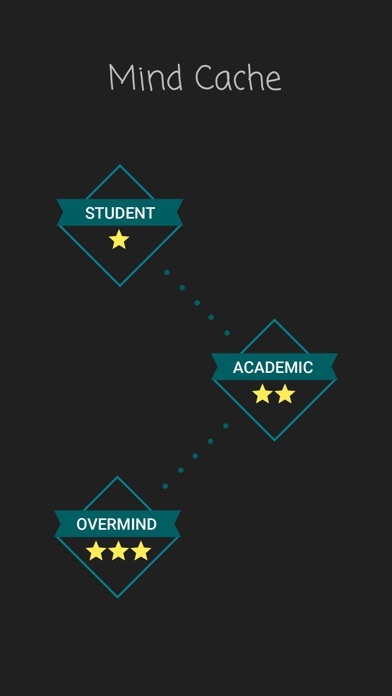 Are there multiple solution paths? 3. Is every situation possible to solve? 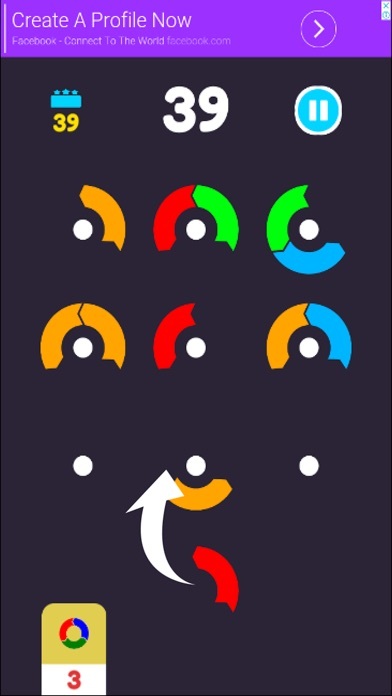 Divisor by G vector is a reverse-point scoring puzzle game. The object is to place the numbered tiles at the bottom onto the grid so that 2 or more adjacent tiles will a factor of each other. 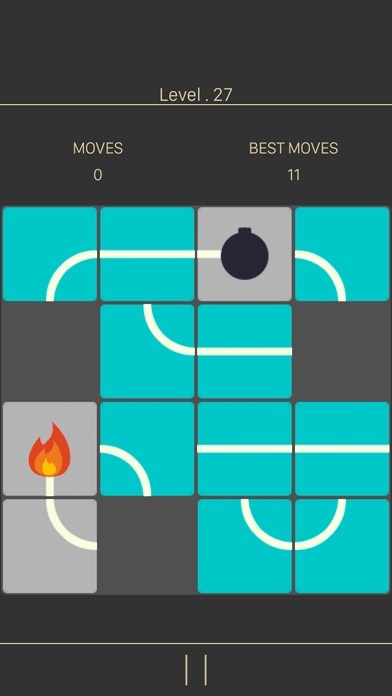 The game ends when there are no more tiles. Doing this with the least # of moves is the objective. Look at image #1. Place the 9 at the top right corner. See the two 18's? They will turn into 2's. Then both 2's will divide into the 42, making it 21. Chain reactions like that are key. 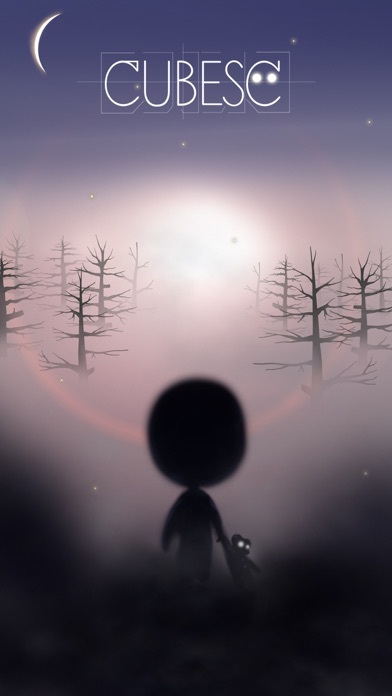 At first I didn't like this game, but I do now. Late Announcement: there's an annual Celebration of Mind dinner to honor Martin Gardner. Various people are hosting dinners around the country/world. It was this past Sunday. Sorry for forgetting to post this. If there's not a dinner where you live, you can plan to host one. 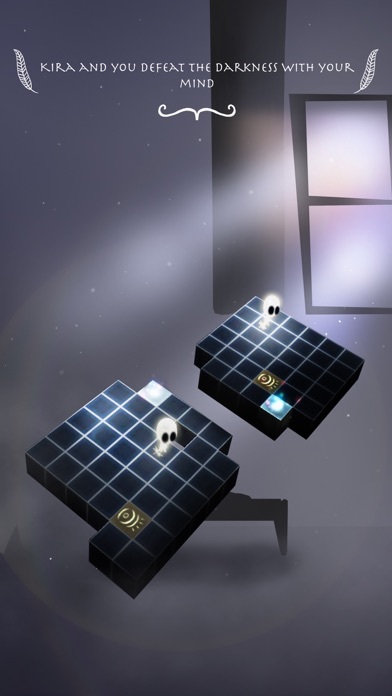 Not long ago I reviewed Dilmer Valecillos's game Cubiques. Cubiques 2 is even better. The object is to get Your Men - the white cubes - to roll over to their target squares. There's a lot to like about this game. 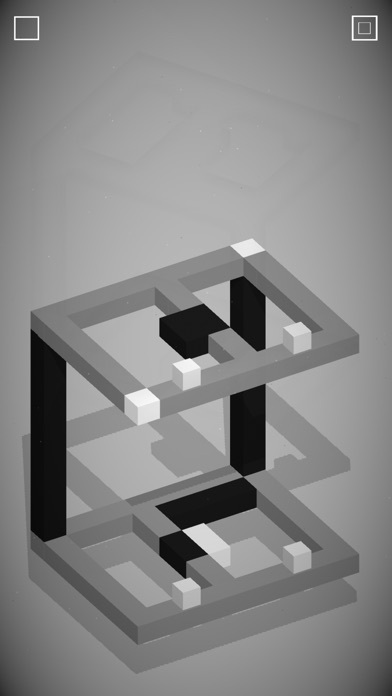 For example, the gray squares can only be rolled over once. This is sometimes advantageous and disadvantageous. The cubes are sometimes on the same grid, but often are offset. The graphics are mostly good. But my criticism of Cubiques holds true for Cubiques 2. 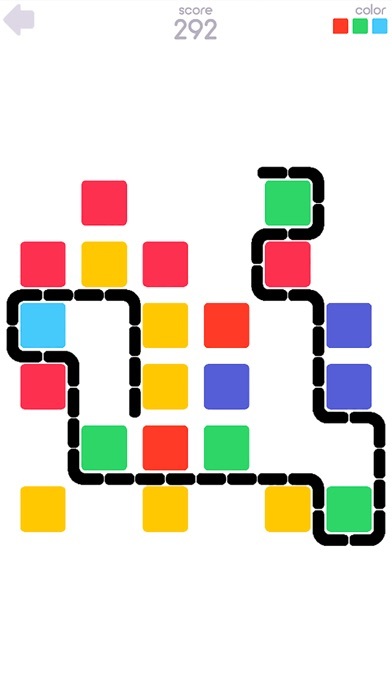 Namely: I want more color variety and I want the ability to rotate the whole grid so I can more easily see the rectangular holes within the grid. There are 70 levels and I've done about 60. According to the Leader Board, not many people have tried this game. That's a pity. Announcement: -Pila- is temporarily free. This past weekend I saw the image of Color 6 and just passed it by. 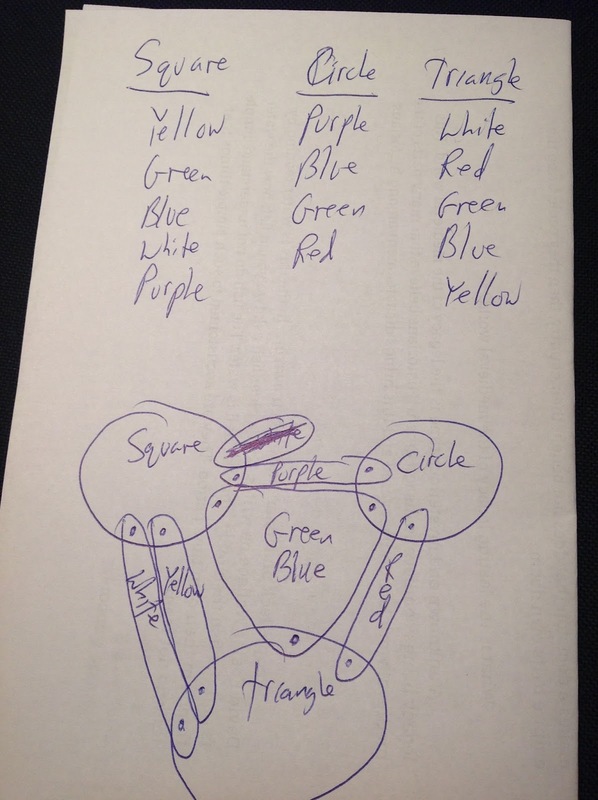 Seemed like another 'packing puzzle' and I didn't scrutinize this properly. Big thanks to Loyal Blog Follower David Cole for alerting me about this game. It's seriously good. 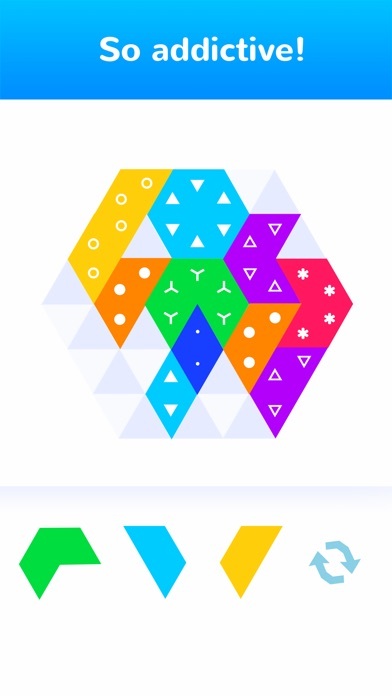 Color 6 is a point scoring puzzle app. The object is to make perfect hexagons of a single color. Each one made is 1 point, then it disappears. I played this game 3 times last night. This morning I played it once and almost got to work late. One feature I really like is the color-blind mode. I wish other games would adopt this idea. My high score is 169. This places me in the middle of 55,000 people. The game came out last week. How did it get so popular? Maybe it was featured by the App Store. It is possible to form 2 hexagons at the same time. If they overlap, only 1 point will be given. 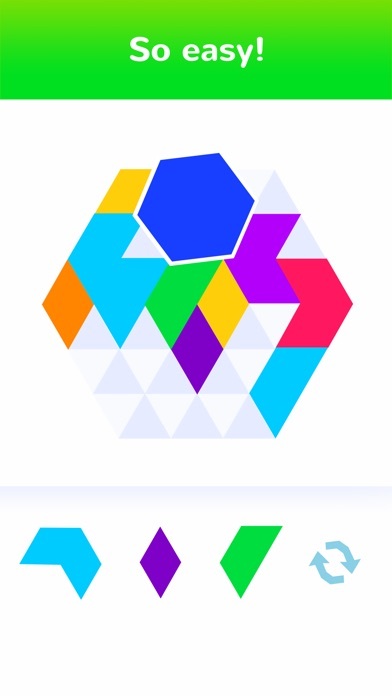 If the 2 hexagons do not overlap, only 2 points are given. I'm a bit mystified as to how so many people have scores in the thousands. Cube Loop comes from Marcelo Pars. 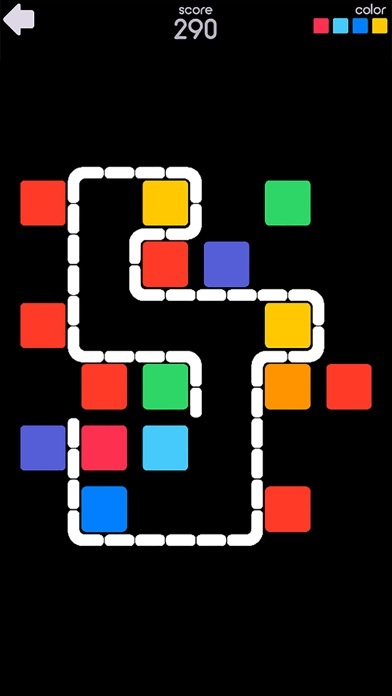 The object is to form paths that connect the start and end points of each color. I played a game almost identical to this about 7 or 8 years ago. Unfortunately, I don't remember the title. 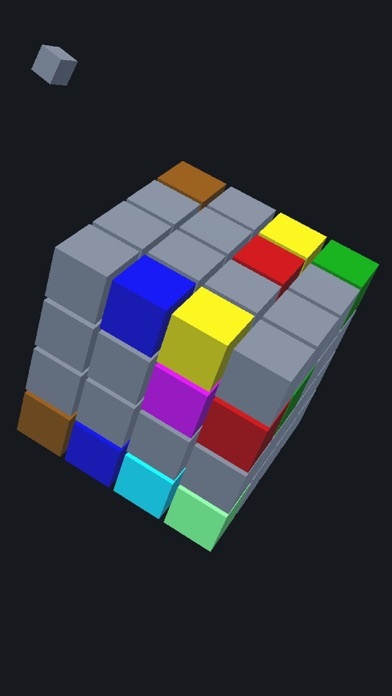 Cube Loop seems too easy at first because the the size of the cube never gets above 4x4x4. 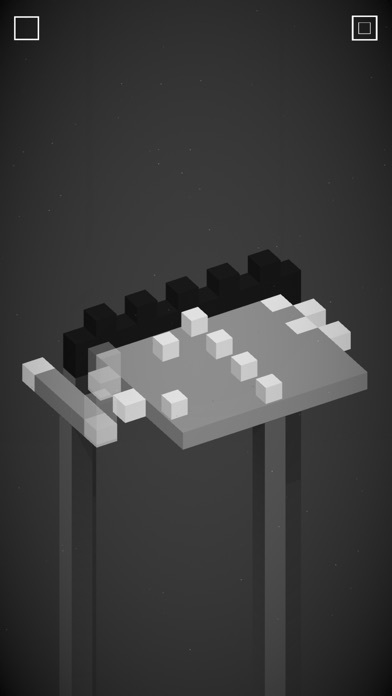 However, I jumped to the last 3 levels, and struggled mightily. 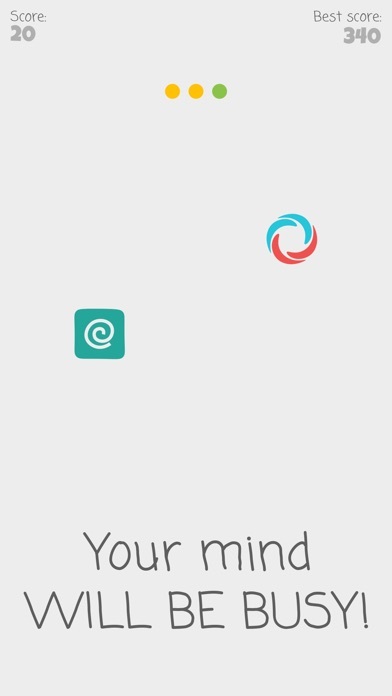 Mind Cache comes from IGOR POSTNIKOV. It's a memory game. An image appears with a Star, a Square, and a Circle. Then they disappear. Your task is to place them on the board in the general area of where they were. This is the type of game to play a few times and then forget about. 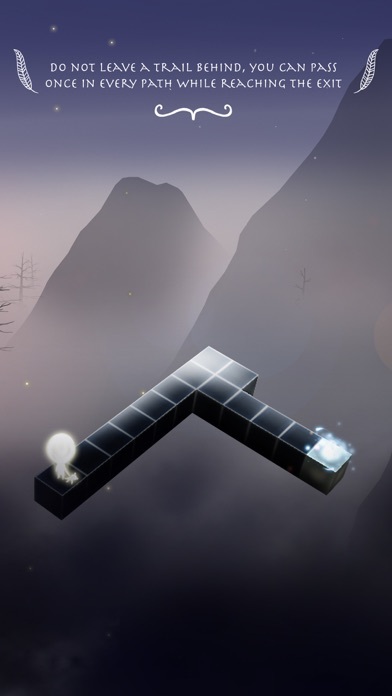 Glowish is a puzzle that has a Lights Out element. 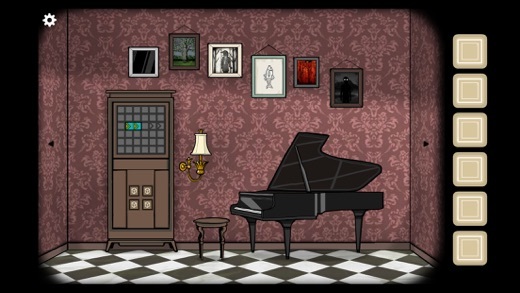 In Lights Out, the object is to light all the tiles. 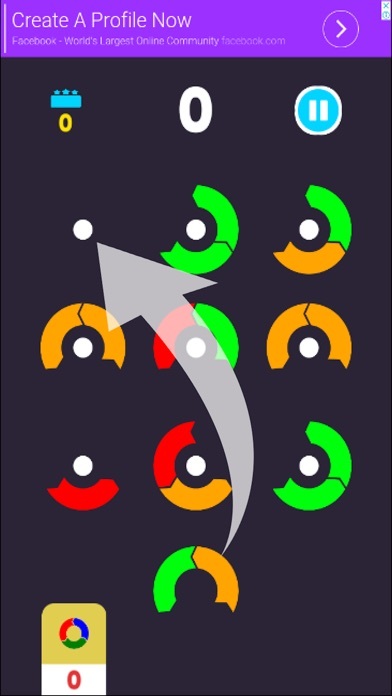 Tapping one button will toggle on/off that tile and its surrounding neighbors. 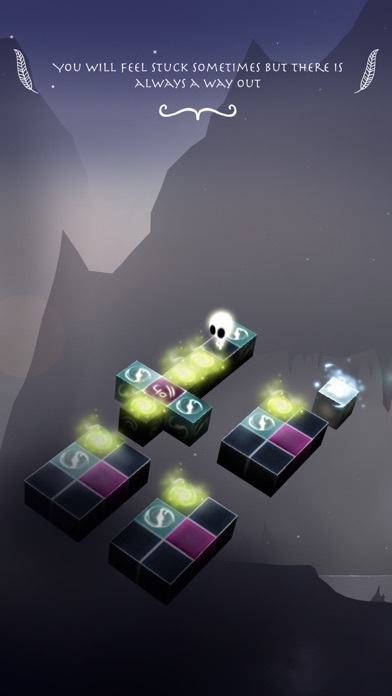 In Glowish, the objective is the same, but the rules are different. 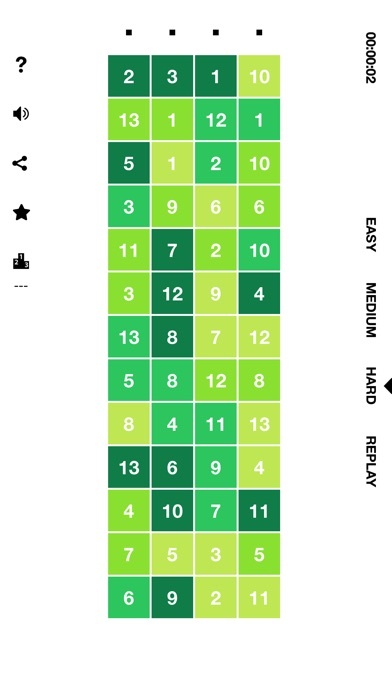 The Essential Rule: Tapping a green triangle will toggle all the triangles and all the other greens. 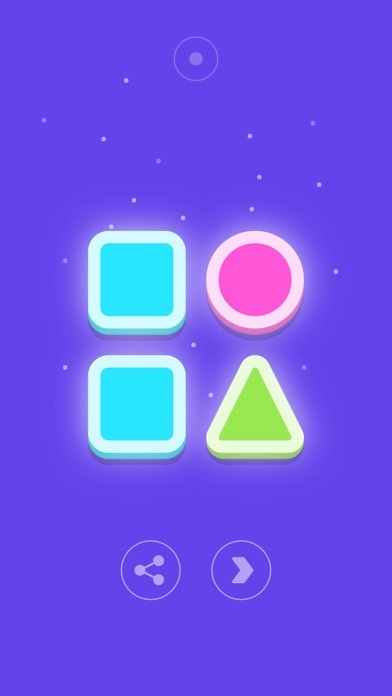 The first levels are pure easy: Just tap each element. Look at the first 2 images. There are 2 blue squares. 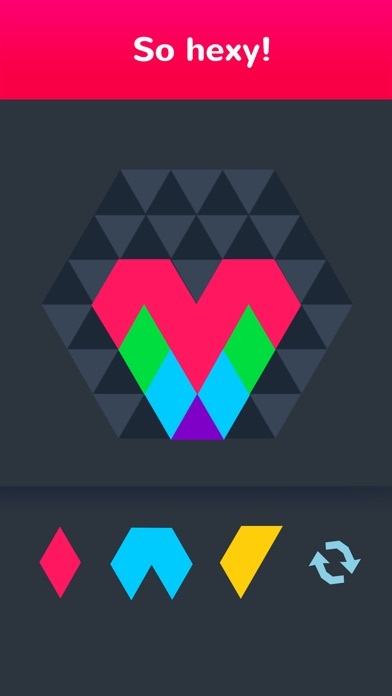 The second blue square does nothing to add the complexity. The second image is a Venn diagram of the situation. 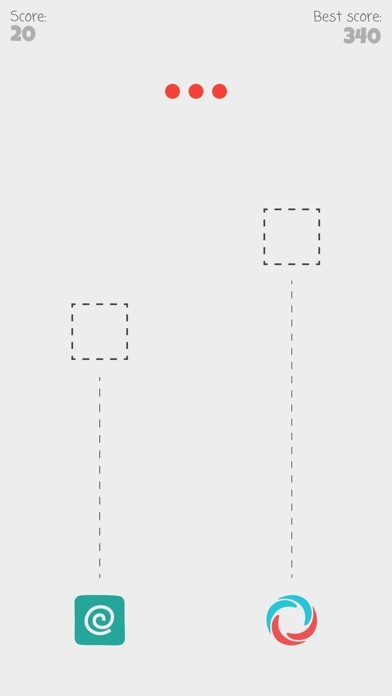 Since none of the elements intersect: just tap each one. 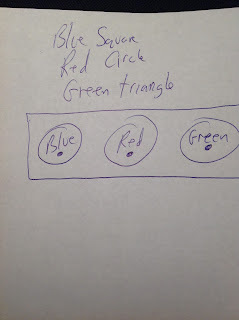 As things got more complicated, I needed to transfer the information to Venn Diagrams to better see the Big Picture. 1. Tapping the blue triangle lights up all the triangles and the blue square. 2. Tapping the orange square turns off the blue square, turns on the other squares and itself. And turns off the orange triangle. You get the idea. I the actual solution was: tapping everything once. There are 100 levels and I'm on level 61 or so. 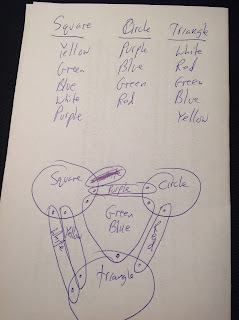 I can't think of another puzzle concept that utilizes Venn Diagrams. Glowish is definitely unique & fun. Do you remember the game Ins and Outs? 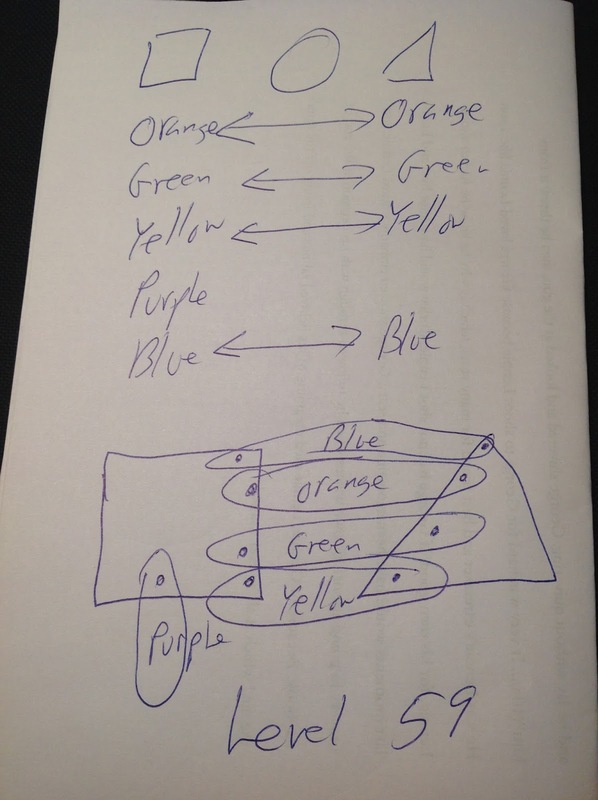 Color Fence is essentially the same thing: create one loop where some tiles are 'inside' and the rest are 'outside'. I love the concept, but after you've done a 100 or so, they're all too easy. But still fun. I had some trouble with Color Fence in terms of the colors. The orange & red squares are too similar. 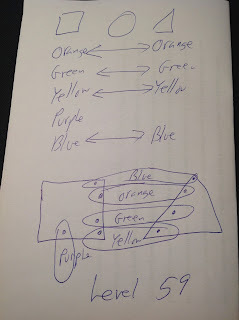 Even worse: I wasn't able to figure out which colors should be inside and which outside. Look at image #1. 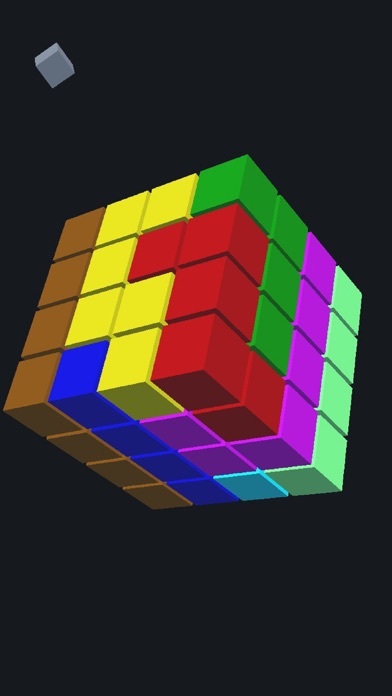 In the top right corner are 3 colors. Are they supposed to all be in or all out? I've tried it both ways and neither worked consistently. I think they've debugged this now. 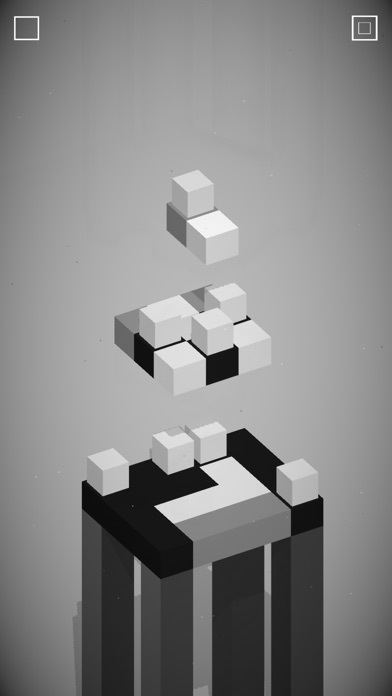 Dilmer Valecillos recently sent me a promo code for his game Cubiques. Thanks! The object is to roll Your Man, the red square, over all the white squares and end up on the yellow square. We've seen this concept many times before. 1. Black squares can be crossed many times. 2. Gray squares must be crossed twice. The graphics are very slick and well polished. Unquestionably this aspect is strong. 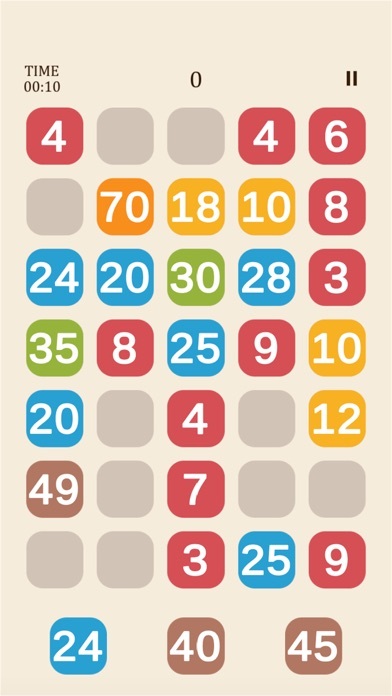 The game board utilizes a small fraction of the screen. I'd like the option to enlarge this. At first, I had some trouble seeing the areas where I couldn't roll the cube. It would be great if the entire board could be rotated. Look at the first image. See the white pillars? That should be a different color. There are 70 levels. 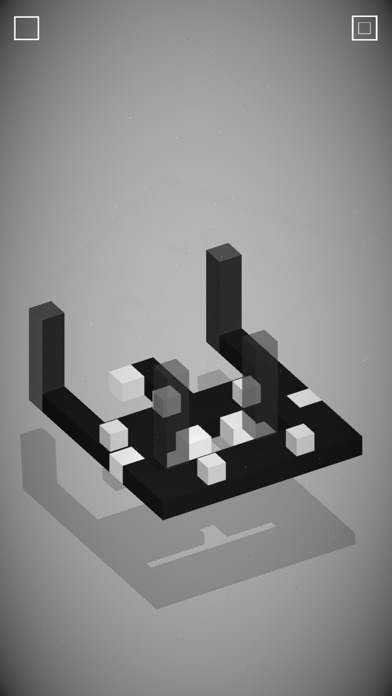 Last night I was on the phone for almost an hour and tackled about 40 levels. I ended at level 58. Had the phone conversation gone another 30 minutes, I think I could have completed them all. The puzzles are not too hard. There is a Leader Board for Cubiques. Which I don't fully understand. I'm # 160 out of 3700 on the levels. But on the Points section, I'm around 15. I'm guessing that the points accumulate by solving the puzzles in a short time and/or solving the levels on the first or second try. Announcement: Subway Shuffle is going to reappear one of these days. The old version no longer works on iOS 11. 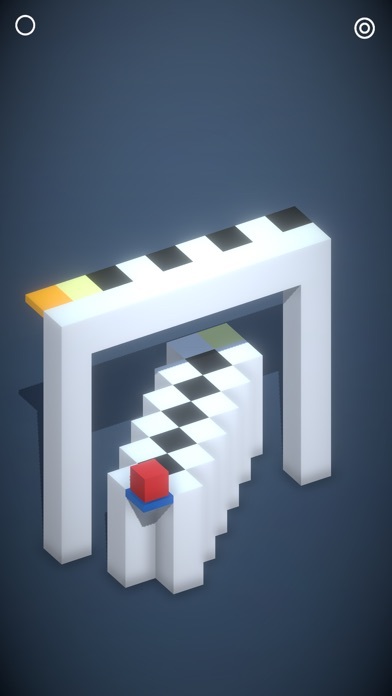 Slices is a dexterity puzzle that tests your speed. Look at the first image. See the blue slice in the center circle? You've got about 3 seconds to transfer it to one of the surrounding circles that has that wedge empty. When a circle is completed, you get points. 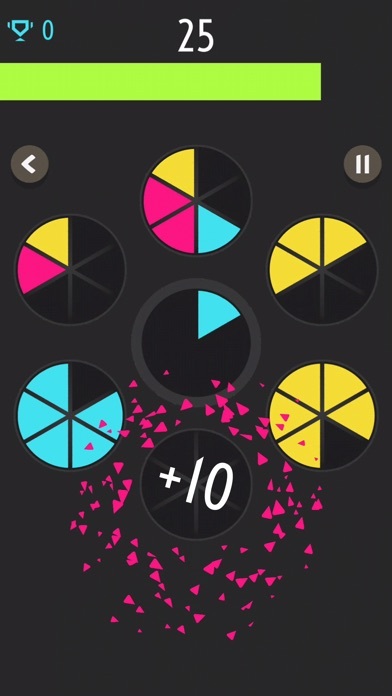 More points if the circle is completely 1 color. That's it. 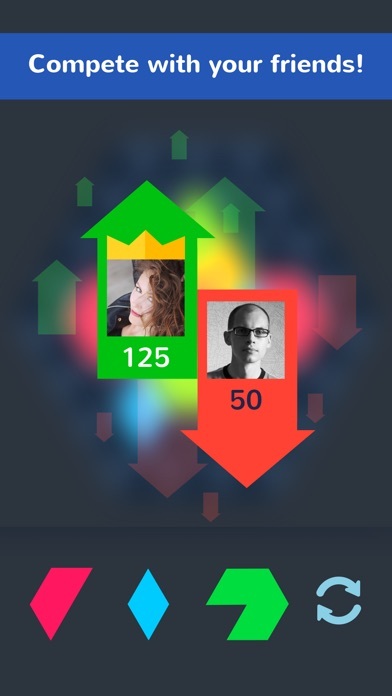 There are over 14,000 players on the Leader Board. Definitely fun. I've only played it twice. Good concept, great graphics. If it were the only speed/time/dexterity around, it would be huge. 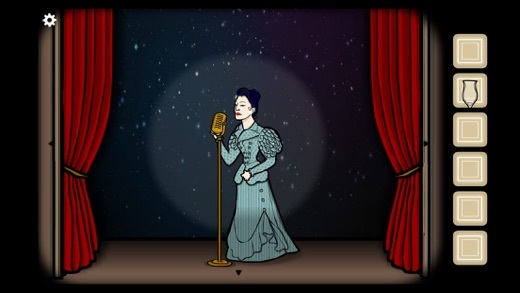 http://illusionoftheyear.com/ Today is the last day to vote for the best of 10 illusions. Very cool stuff. annecoleviolinmaker.com Anne Cole is a longtime Loyal Blog Follower. Scroll to the bottom to check out the PBS video of her making violins. Considering all the horrific incidents in the news, these 2 items form a nice respite and hope for humanity. 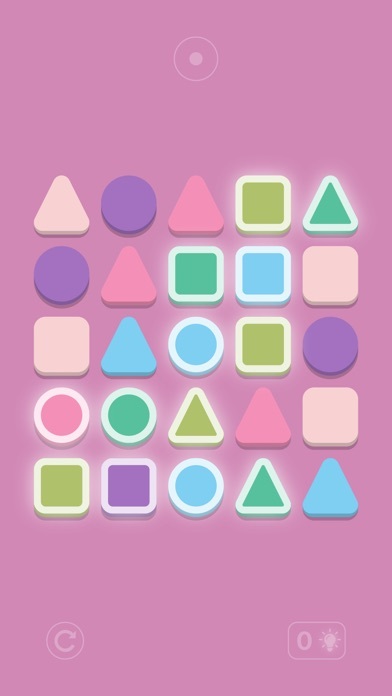 As always, if you're playing a good puzzle app that I have not blogged about, let me know. Slide!! 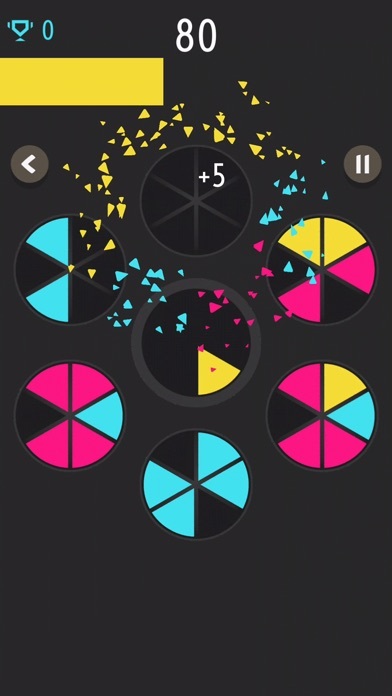 is one of those many puzzle app games where the object is to get the colored tiles to their targets by sliding them until they hit an obstacle. 1. There's a timer. In order to get your time low, you must slide multiple blocks simultaneously. 2. 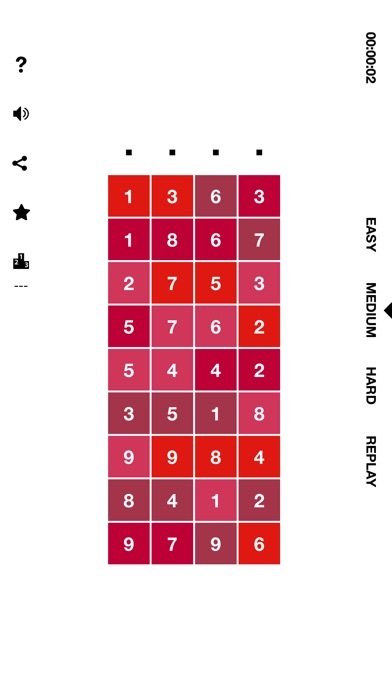 I'm stuck on Easy Level #5! Obviously I'm missing something. Because the credits indicate that 25 people have play tested this game. This Puzzle App Blogger is often humbled. 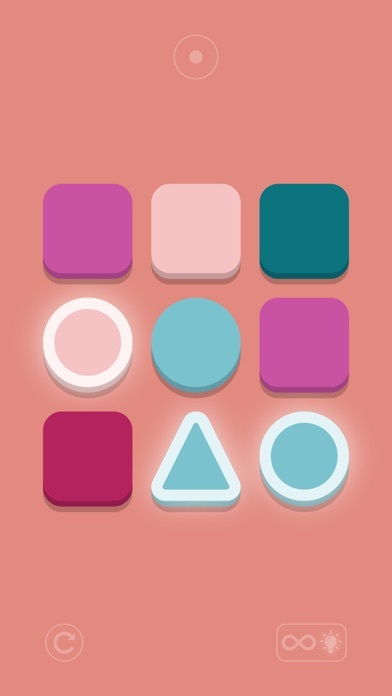 Last week I reviewed Colorzam by Pedro Navarro. He emailed me about my review and indicated that he would implement one of my suggestions. So now the '5 rule' is '6'. The game is significantly harder! It might be too hard now. I checked the Leader Board & I'm still #1. But is that fair? I attained that score under the easier rules. Can I still claim the glory? Pedro: I think if you make the grid a bit larger, the game might hit that perfect sweet spot of difficulty. 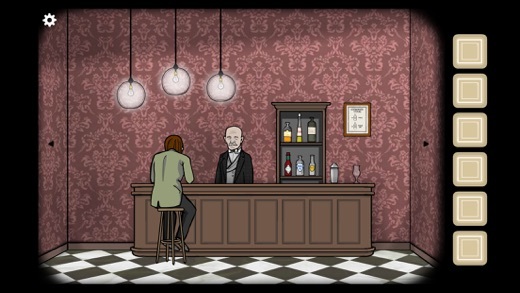 Everybody else: play test Pedro's game and send him some feedback. 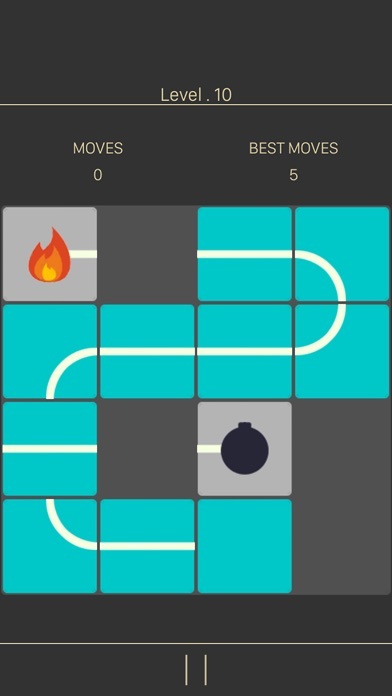 Unblock Bomb comes from Kejia Li who also made Puzzle Dots Game which I reviewed recently. The gray squares are fixed. The object is to move the blue squares to complete the circuit. 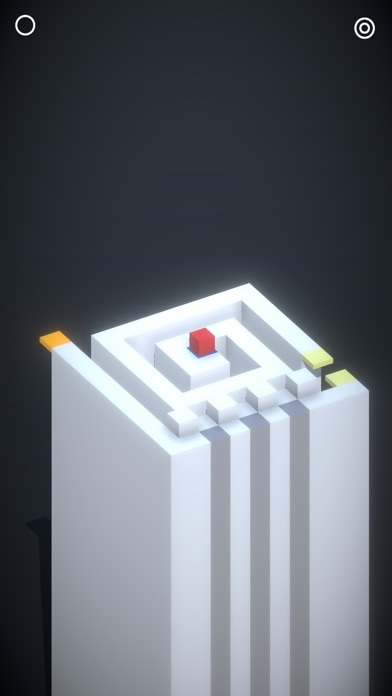 I've solved about 40 levels. I was hoping the game would get more interesting or difficult. It did not. This game is strictly for kids. What could be done to make this better. 1. Change the colors every so often. 2. 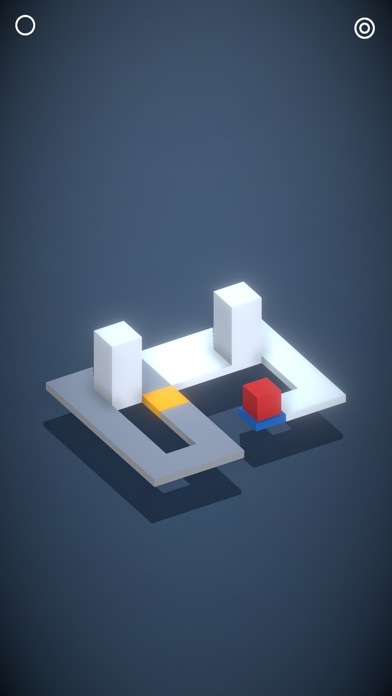 I solved some levels in fewer moves than the supposed minimum. 3. Don't allow more moves than necessary. 4. How about an explosion after each level is solved. 5. I didn't listen to the music, but a good selection would be the theme from Mission Impossible.